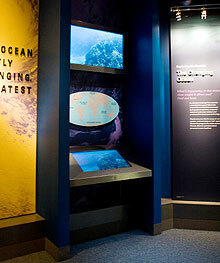 The Ocean Today Kiosk at Sant Ocean Hall at Smithsonian Institution's National Museum of Natural History. The Ocean Today Kiosk debuted on September 27 with the opening of the new Sant Ocean Hall at the Smithsonian Institution's National Museum of Natural History. The kiosk, developed through leadership by the National Ocean Service, presents news and video stories that highlight some of the most interesting, surprising, and pressing issues facing our ocean today. Through a large touch-screen interface, kiosk visitors are offered a wide variety of short videos about ocean life, current science and technology, and recent discoveries. NOAA and partners will continue to develop new videos for the kiosk over time to ensure the content remains fresh, timely, and relevant. The kiosk also features a 'current news' section, presenting users with near real-time data about current ocean and weather conditions around the U.S.
Coral reef tank at the Sant Ocean Hall. While the Sant Ocean Hall will be the permanent home for the Ocean Today Kiosk, the videos developed for the project will be shared with a growing network of aquariums across the nation through the Coastal America's Ecosystem Learning Centers. This partnership will ultimately provide opportunities for 20 to 30 million people to learn about the importance of protecting the ocean.